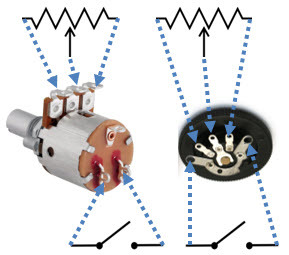 Volume controls, also called potentiometers are variable resistors that come in a variety of sizes, but usually do the same thing—control the amount of audio circuitry amplification. Wiper (Blue) Resistive coating (Blue) . They do this by sliding a wiper over a strip of resistance material. 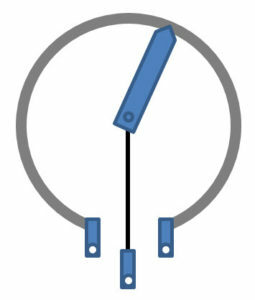 As the wiper is moved clockwise or counterclockwise the resistance between the three terminals changes in unison. In the fully counterclockwise position the switch disconnects the battery or other circuit being controlled. 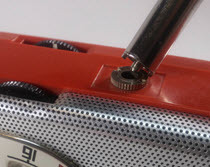 The center terminal on the volume control is often the starting point for many troubleshooting tasks, since it’s close to the point where radio waves become audio signals. Handy signal tracing test point. 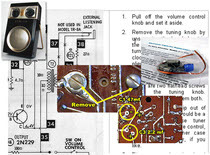 Volume control’s in transistor radios often contain power switches as well. Occasionally these switches fail. Sometimes you think a control is defective when, in fact, the knob is broken and spins on the shaft without controlling the volume or power.